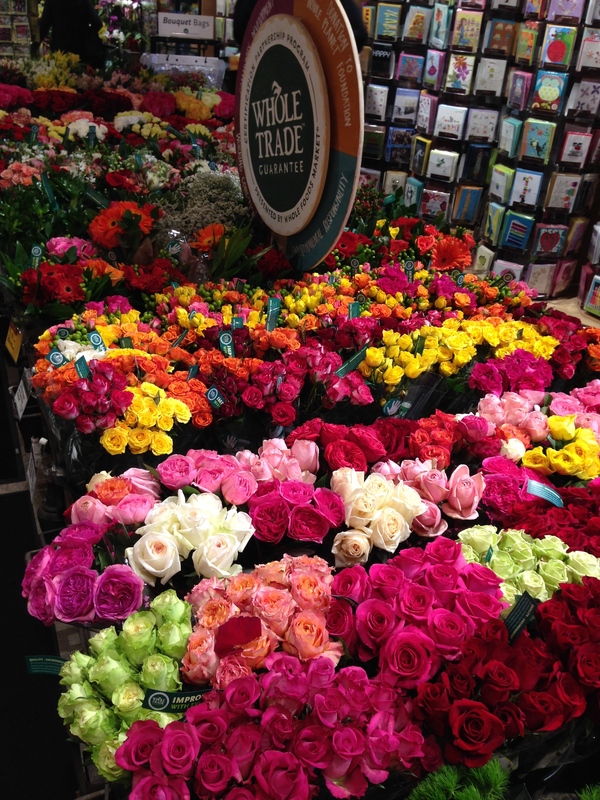 I took a trip to Whole Foods. Ok, so I take a trip to WF all the time. In fact, I shop at my local Whole Foods approximately once a week to stock up on my delicious organic fruits and vegetables. 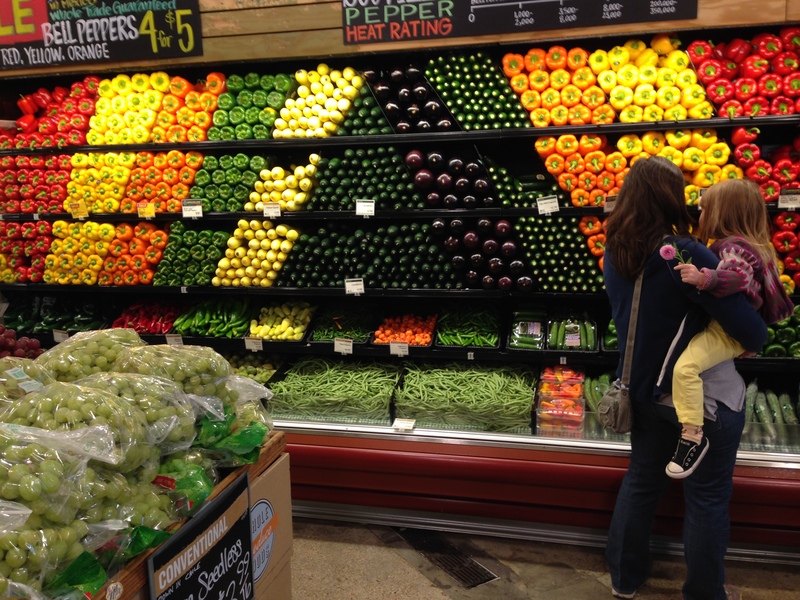 I really have a great time while grocery shopping there. 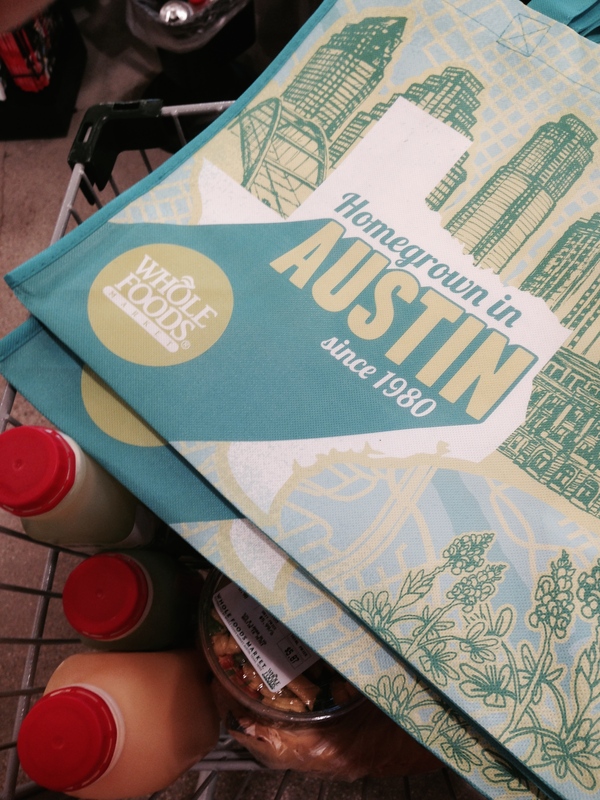 What I experienced last month though, at the Whole Foods Flagship Store in Austin, Texas was pure bliss. I went to Austin with hubby to visit family and when the opportunity presented itself on a Saturday morning to spend an hour and a half there, I took it. I pranced out of the hotel room, programmed the GPS in the rental car and sped down those vast, open Texas highways. I have never felt more care free and excited about a solo trip. Besides hanging out with my awesome family it was the highlight of my trip so I thought I’d share it with y’all. I took these pics with my handy dandy iPhone too. Didn’t want to look to crazy with a big camera. I was two weeks into my new journey of trying to eat mostly (90% or so) raw vegan so I needed the extra inspiration. 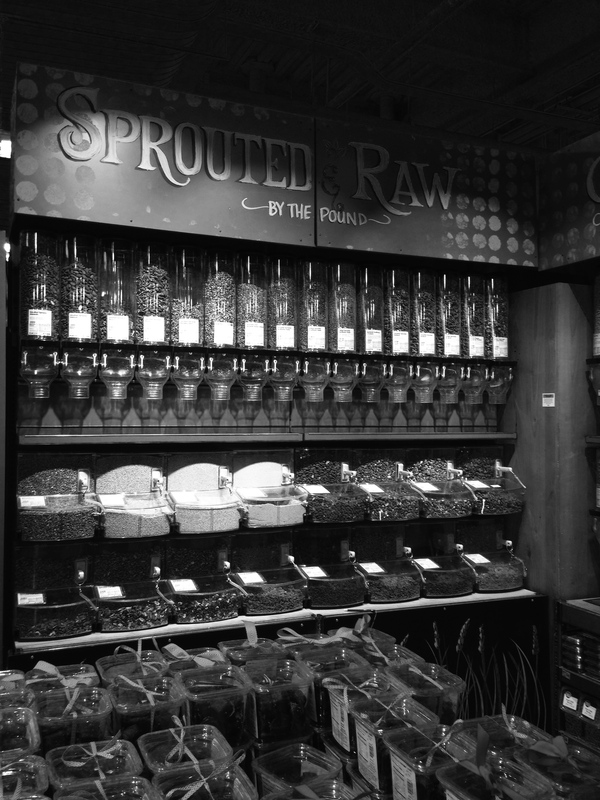 Sprouted & Raw nuts and seeds. I didn’t have time to sample any but they looked delectable. I got a few reusable bags for souvenirs. 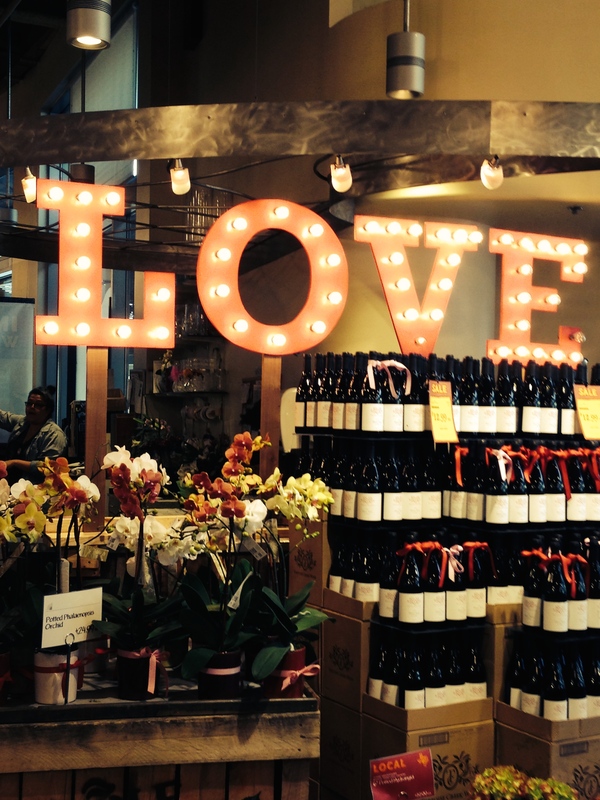 It was a few days before Valentine’s day so LOVE was in the air. Whole Foods Raw (and some organic) JUUUICE!!! They were divinely delicious. I bought 3 of them and all 3 were out of this world good. 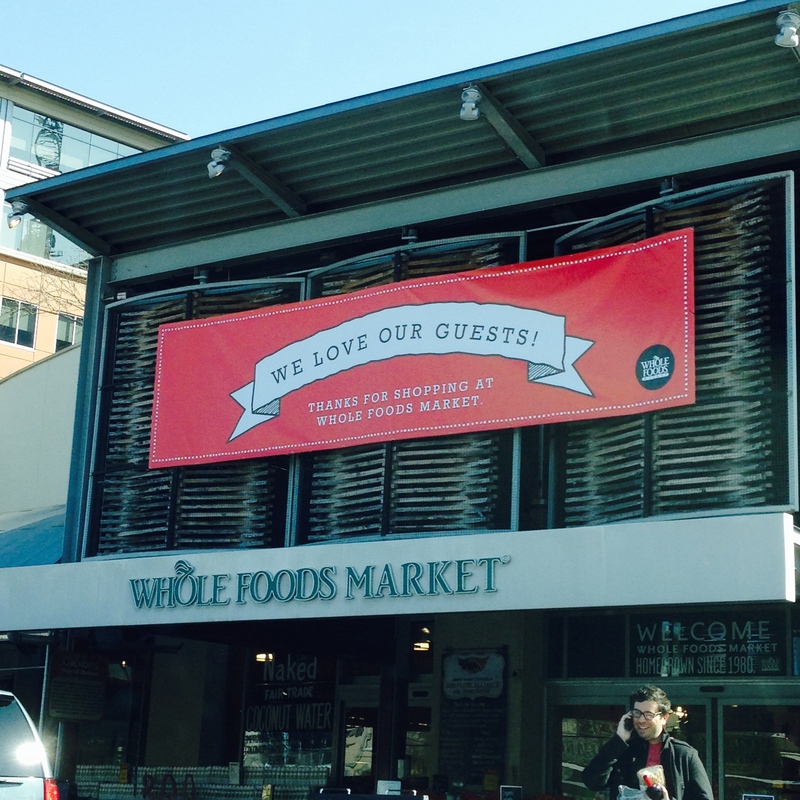 Great job Whole Foods! 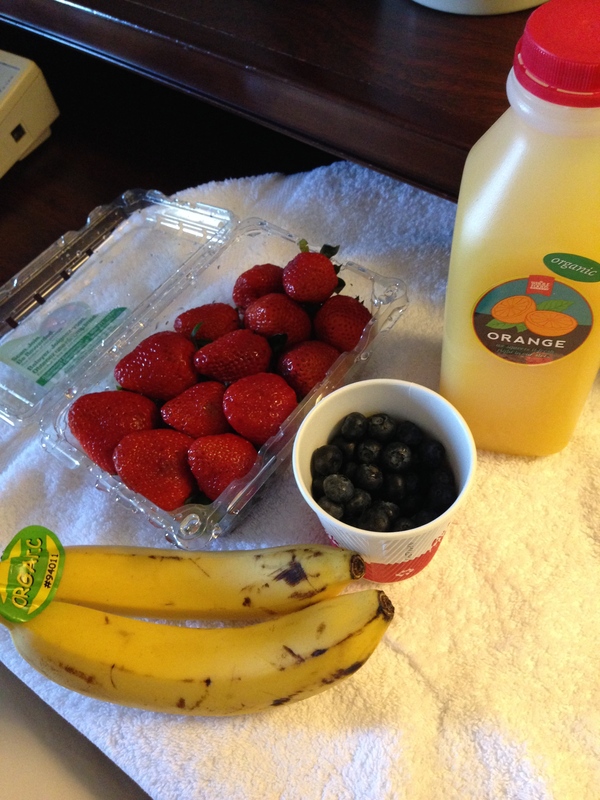 My all organic Sunday morning hotel room Breakfast in Austin courtesy of WF: orange juice, strawberries, blueberries and bananas. Deeeelicious :-)) Go RAW! 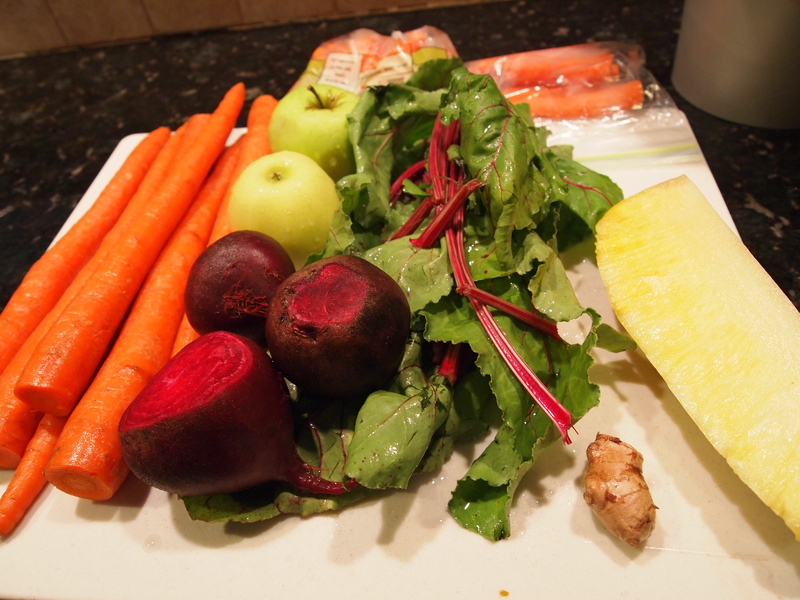 I’m so glad I’m back to juicing and blogging about it. I took a very long break from doing both most of this year to pursue other personal goals that suffice it to say left me feeling drained and hopeless. I am finally beginning to feel like my true happy self again and I owe much of that to my beloved 5 year old Breville juicer and my yummy hubby. While in the throes of my sadness I forced myself to think of (and act on) activities that bring me joy and juicing was pretty much at the top of the list. Ok, so maybe juicing tied with sleeping 9+ hours on my days off regardless of how many ‘important’ and ‘timely’ errands I needed to run. So here are two recipes that I made on a day I literally slept in till 11am! These recipes are raw, fresh, mostly organic and quite delicious. Give them a try!I had one for breakfast, at 12pm 🙂 and one for lunch at 3pm 🙂 🙂 with lots of water in between. I LOOOOVE having a day off. I mean, who doesn’t? Nothing inspires me more to create delicious and healthy recipes like having a day off spent ONLY at home. My internal alarm/bladder woke me up at 5:40am which I was very upset about but I turned my frown upside down and found about four more hours of blissful sleep. I then woke up feeling refreshed and of course ready to have a fresh organic raw homemade green juice! I generally make smoothies when I’m headed to work and juice on my days off. Today’s juice had to be simple, green and as always yummy! 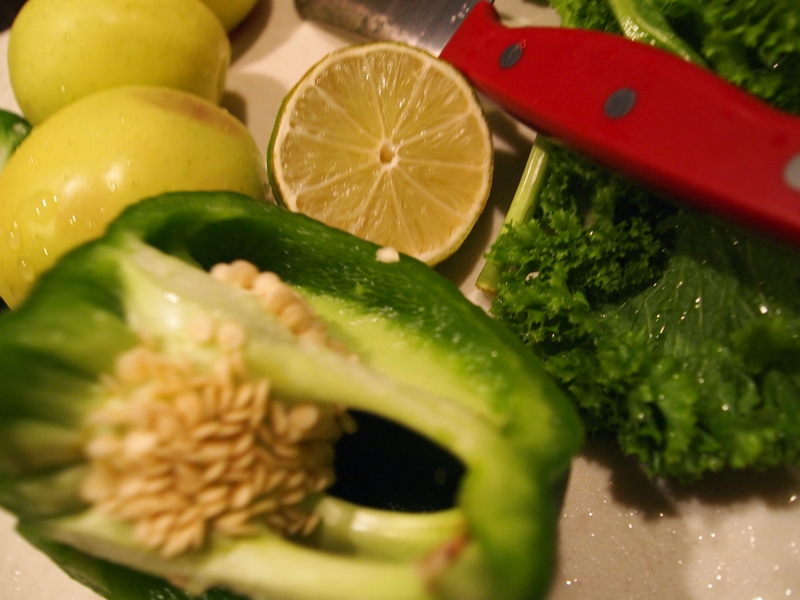 Here are a few tips to make your juicing process far more enjoyable. 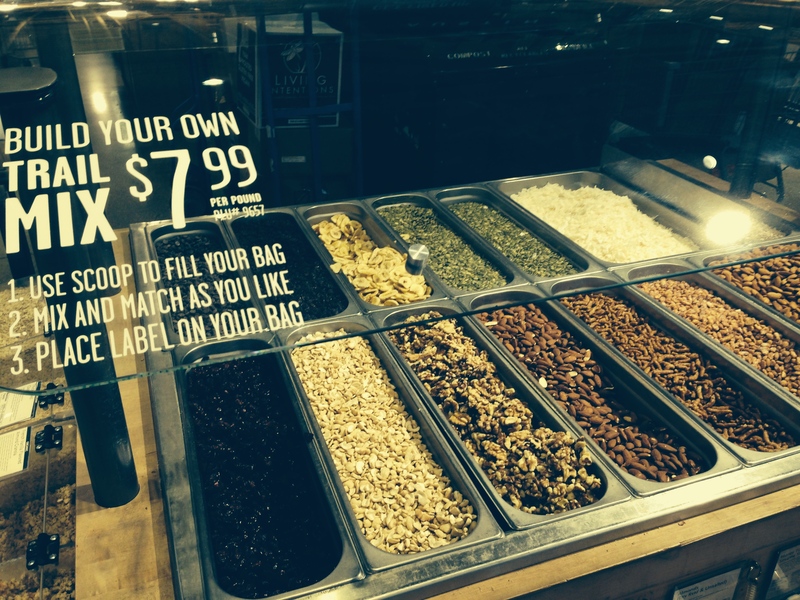 Line the pulp container with a plastic baggie that you would usually get at a grocery store. It saves on clean up time! ALWAYS clean all the parts of the juicer immediately after juicing. It makes for an easier clean up and extends the life of your juicer. Dried-on pulp on your juicer’s parts is not the business! If you’d love to have juice for breakfast and would like to save time in the morning then clean your produce the night before. Always keep your juice recipes simple. Unless you’re nuts like I am at times and want to make an ‘everything’ juice and an ‘everything’ green juice. I try to keep my recipes under 5 ingredients. You really don’t want to know what celery, ginger, carrot, beet, tomato, apple, garlic, kale, lemon and collard juice tastes like, trust me! My everything juices were beyond delicious though 🙂 There was a method to that madness. Here is a look at just 5 of the many incredible benefits of juicing. The Standard American Diet (or any diet that is full of highly processed foods) is deficient in nutrients necessary for optimal health and filled with toxins that contribute to the chronic degenerative diseases many suffer from. Juices are a great way to provide an abundance of nutrients. They are full of vitamins, minerals, enzymes and antioxidants that are sure to help the body heal from the inside out. 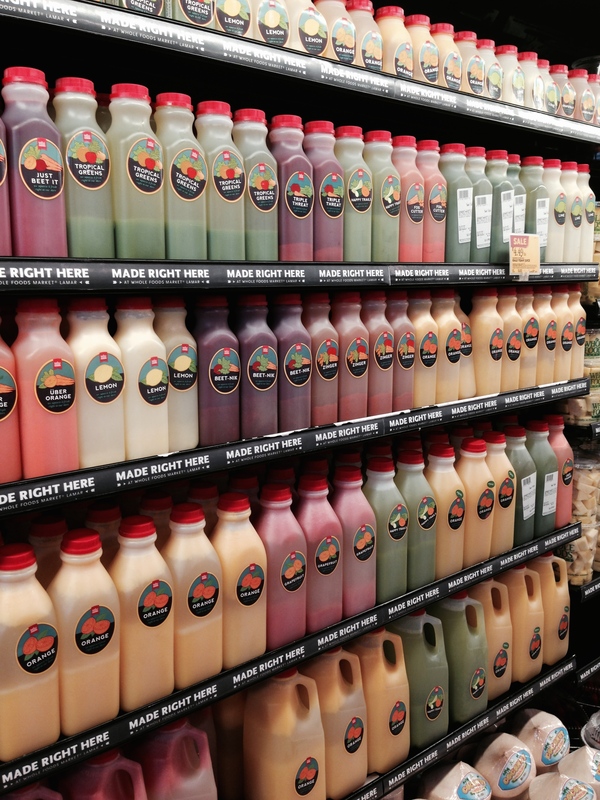 Fresh juices are an easy way to consume nutrients found in a large amount of produce. They are in no way though, a substitute for eating fresh fruits and vegetables. Juices are energizing! Fresh, raw juices have living energy and are assimilated into the body very quickly. It is extremely important to drink juices immediately after they have been prepared in order to get the most benefits. 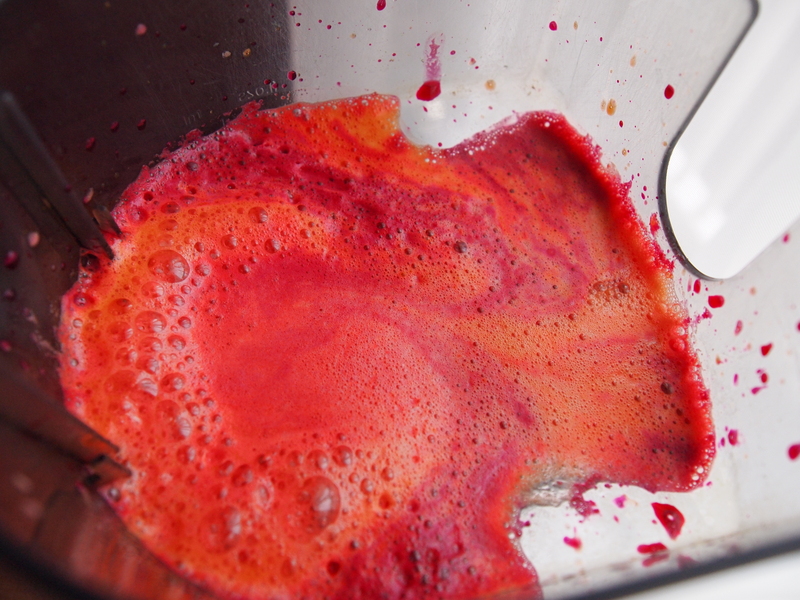 Juices begin to oxidize and lose their nutritive power the longer they are stored. For anyone concerned about calories, juices have few calories, a high amount of nutrients and are very filling. They are a great addition to any weight-loss plan. Juicing an array of fruits and vegetables provides your body with an immense number of nutrients which boost immunity such as vitamins A, B, C & E as well as carotenoids, manganese and selenium. Juices, mostly those of leafy greens, are highly alkaline and help counteract the acidic state found in those who consume a mostly Standard American Diet. An optimal pH for the body is extremely important for all metabolic processes. Check out this detailed article by Dr. Robert and Shelley Young to find out exactly why consuming mostly alkaline foods is necessary. They also have an acid-alkaline food chart which makes a great guide for anyone. I can attest to having experienced all these benefits since I began juicing exactly four years ago. If you think you’re ready to start juicing and improve your health, the next step is choosing a juicer. Read this to figure out the best type of juicer that will fit your needs and budget. 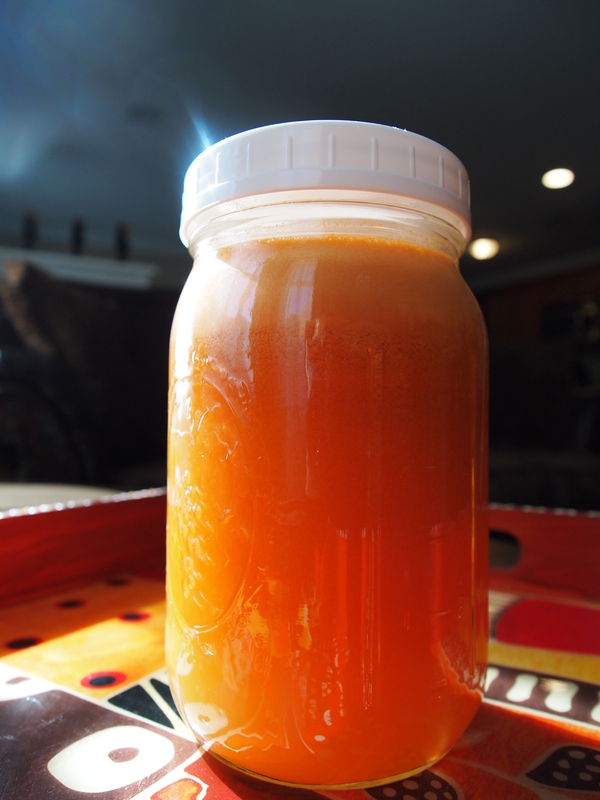 Lastly, here is one of many free juice recipes on this site to get you started. What benefits have you experienced from juicing? 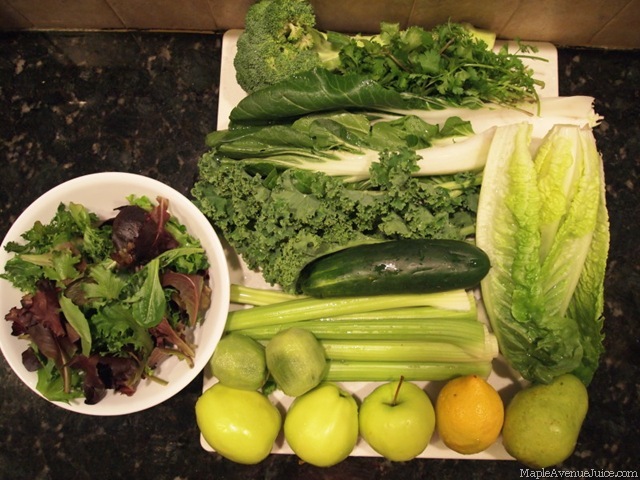 Juice Recipe #23: Lean Green Juice! 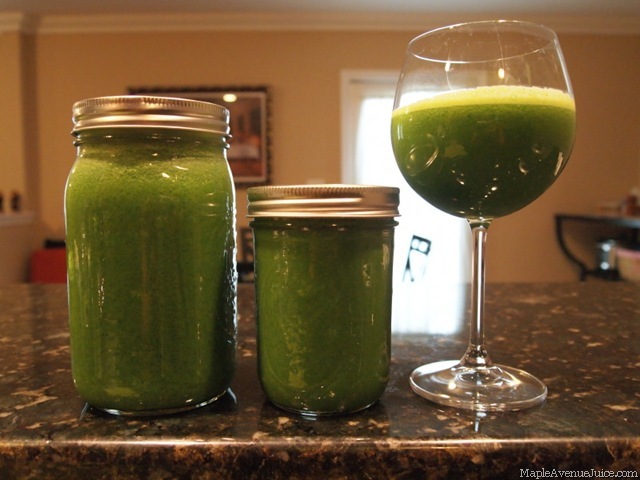 This green juice recipe is sure to make you feel & look great. It was the perfect light and super healthy breakfast recipe and it has super ‘green’ powers to make anyone lean (after lots of doses on a consistent basis alongside a healthy diet of course). Yes, being lean doesn’t come easy. I know because I’m still on that path but I love and appreciate every step I make in the right direction. And by lean, I don’t mean skinny, I mean… ‘right & tight’ 🙂 I just can’t think of a better way to describe it. Feel free to help me out. Anyway, here’s the recipe to this delicious and refreshing green juice. Your whole body will thank you for it. This made exactly 32 ounces which is a whole lot but I woke up starving, ran a few miles and needed that much. Cut ingredients in half to make the usual 16oz. Some of the benefits of this green juice, just to name a few, are that it is anti-inflammatory, alkaline, a diuretic, promotes weight loss and improves immunity. 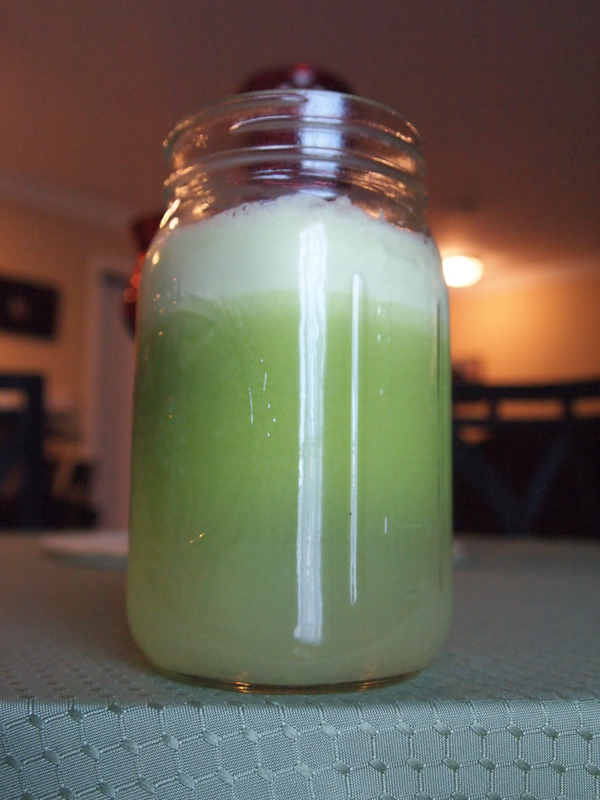 I was craving a green juice today and made this tasty juice that looks anything but green. In fact, I’m not fond of its color but it packs some serious nutrient power so whatever! I purchased some collard greens at my local supermarket a few days ago that were calling my name. I’m sure I’m not the only weirdo that sees a gorgeous veggie in the market and just has to have them. That’s how I felt about these collards when I laid eyes on them. They were fresh, large, leafy and the most gorgeous shade of green. I LOVE Collard Greens or what I grew up referring to as Sukuma Wiki, google that! Collards and Kale are definitely my favorite greens. I grew up eating them sauteed with onions and tomatoes. My mouth is watering just thinking about them. But given that this is a juicing blog and I was craving one I thought I would create a juice around them. It just refused to become green though thanks to the carrots. Go carotene! I also was excited to drink a veggie juice out of the glass in the picture. It was a wedding favor from a wedding I attended two weeks ago and I can’t say I’ve ever been more excited about a favor. Silly, I know! Collard greens are loaded with Vitamin A, C and K, along with calcium, potassium and omega 3 fatty acids. Greens are definitely nature’s secret weapon. 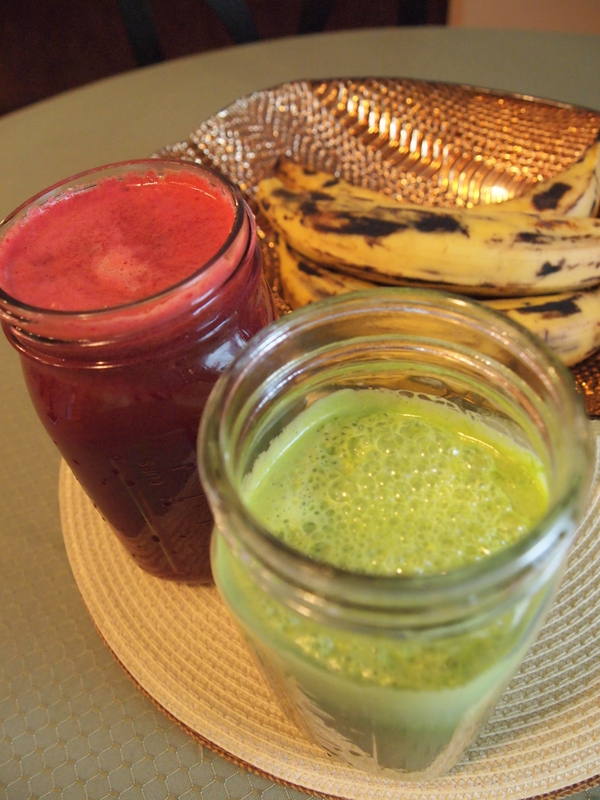 Here’s one recipe that helps you drink your greens and get filled up on these nutrients. 2-3 large collard green leaves, thouroughly washed, stem and all! I was so eager to get this blog started and begin sharing the wonderful new juice recipes I was creating in my kitchen that I completely forgot to go over a few basics that anyone new or old to juicing might like to read about. I remember how hungry I was (and still am) for information in the beginning of my juicing journey. Having said that I would like to take the time to discuss very simply and clearly the three main types of juicers along with their pros and cons. This is by far the most popular and most affordable type of juicer on the market. These juicers have a round disc with sharp blades that grind the vegetables and fruits as you push them through, allowing the juice through the sieve and out the spout while discarding the pulp on the opposite end into a container. most affordable (price range is about $40-$300). they have a wide mouth/large feeding tube which means you don’t have to chop up your fruits and veggies too much or at all. they have several (some quite bulky) parts to clean. I place a plastic baggie in my pulp container before I begin juicing which makes for one less part to clean up. I also clean the other parts immediately after juicing and before enjoying my juice. The shredder/grinding disc spins incredibly fast which means the juice begins to oxidize. Try to always drink your juice immediately and store only if you must regardless of what juicer you use. 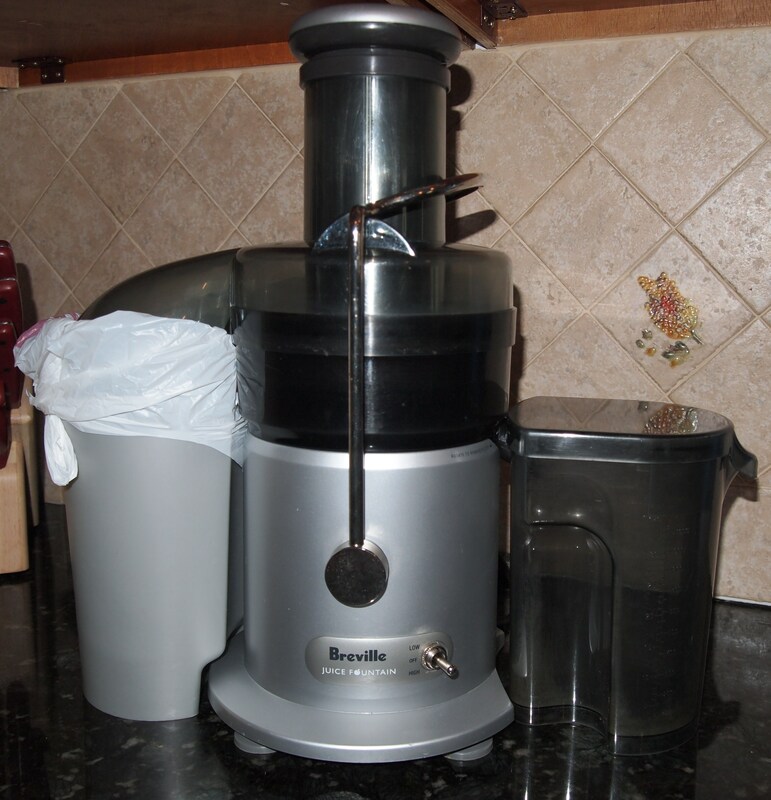 I own a Breville Juice Fountain Plus that I purchased in December of 2008 for $120 (with my Macy’s coupon). 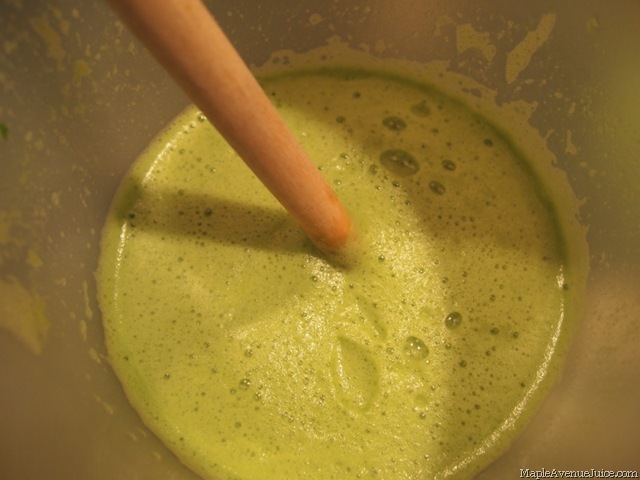 Check out the first green juice recipe I ever made with it. This is the one and only juicer I have owned and it has NEVER given me a problem. I use it several times a week and the only con that sometimes makes me want to get a new juicer is the fact that it is just ‘ok’ with leafy greens. Otherwise, I love my juicer, take good care of it and feel eternally grateful for the abundance of health that has come my way because of what it can do! These are single gear juicers and tend to be more expensive than centrifugal juicers. They work by slowly grinding vegetables and fruits and then squeezing the juice out. After doing a bit of research if I wanted to purchase a masticating juicer I would get the Omega Vert VRT350. They seem to have great reviews across the web, have a 10 year warranty and are upright which means they take up less counter space! These juicers also work by grinding and pressing the juices out except they have an even slower RPM and double the gears to produce the highest quality juices a juicer can make. produce an incredibly high quality juice that barely undergoes any oxidation or exposure to heat. take the longest to make juice but good things come to those who wait, right? have several parts to clean that can be a bit of a hassle. Check this out to see what I consider to be the Rolls Royce of juicers. They cost a pretty penny but they definitely get the job done exceedingly well. What juicer do you own and what kind is it? Do you agree or disagree with these pros and cons? Do you have a ‘dream’ juicer? that’s when they taste the best/super fresh! they are just the right temp for me, not too cold and not too warm. I’m one of those “water with no ice please” people. A few juices tend to taste better chilled or on ice though. We don’t live in a perfect world though so because I have to get up at an ungodly (5:30am) hour to get ready for work tomorrow and every minute of sleep is worth more to me than my first born child (that I don’t have yet), I juice the day before sometimes. Sssshh!! Don’t tell the juice gods. But do tell about this awesome recipe when you try it. 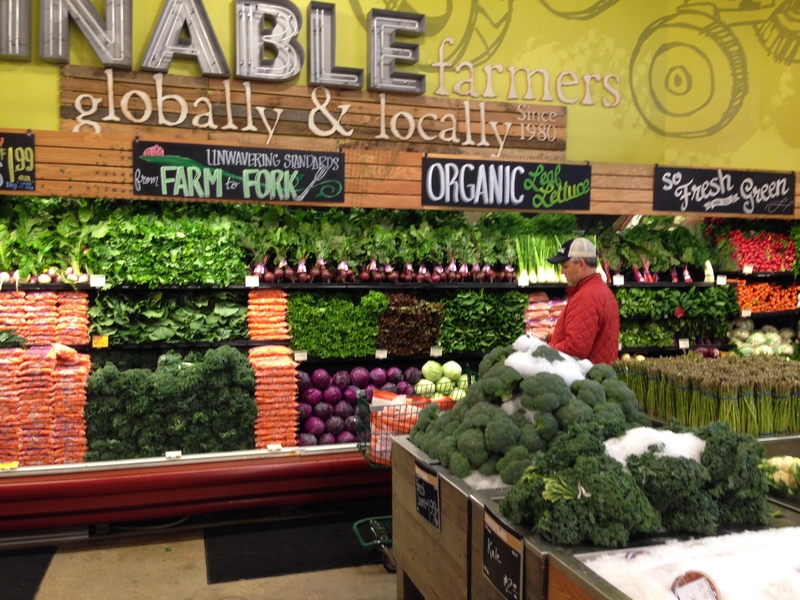 Go with organic veggies and fruits whenever possible but if you had to pick only two (heehee!) 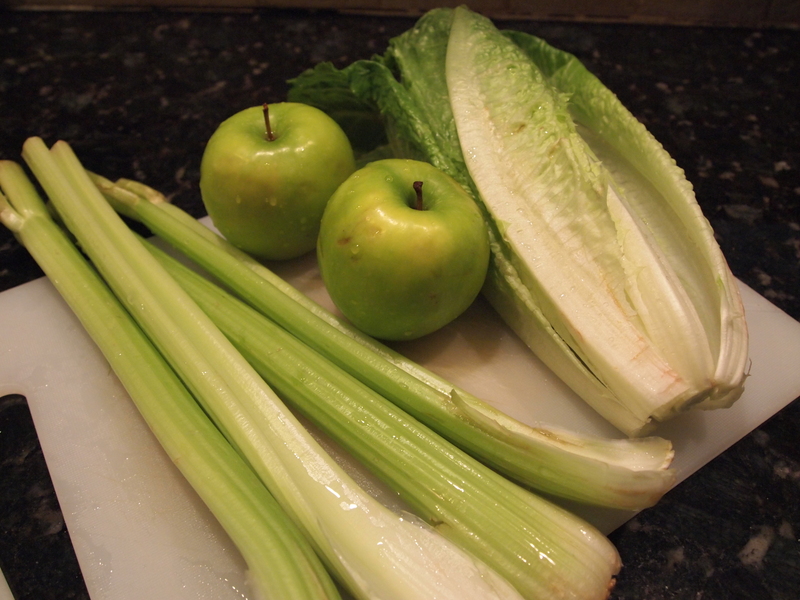 go with the celery and apples. They are always at the top of the naughty list for being super high in pesticides. PS: Fill your container all the way to the top with your juice if you’ll be storing it to minimize the amount of air and therefore oxidation of your juice. So after creating an ‘everything’ juice last week that was really delicious I was obviously inspired to make an ‘everything’ green juice. I had an abundance of green fruits and vegetables in the fridge and got to work as soon as the idea came to me. While the first ‘everything’ juice was AMAZING and so was this one, I don’t think I’ll be doing this too often. I love my kitchen, it is by far my favorite space in my home, but like with anything else I prepare I prefer to be in and out so spending lots of time preparing lots of different fruits and vegetables for juicing is not my cup of tea. I like to keep it simple! (and spend more time drinking/eating my creations). One of the many things I am most grateful for since I started this blog is that it has truly inspired me to get more creative with my juicing and to overall live a healthier life. I hope it does the same for you. Even if you never make your own ‘everything’ green juice, I dare you to find healthier, new and exciting ways to prepare meals/juices for you and your family. You might really love what you come up with 🙂 and your body will thank you for it. Here are the ingredients for my ‘everything’ green juice, all organic: Cilantro, Bok Choy, Kale, Green apple, Lemon, Kiwi, Romaine Lettuce, Mixed baby greens, Cucumber, Celery, Pear and Broccoli. Yeah, I know… I went way overboard! I had about 60 or so ounces of green juice. 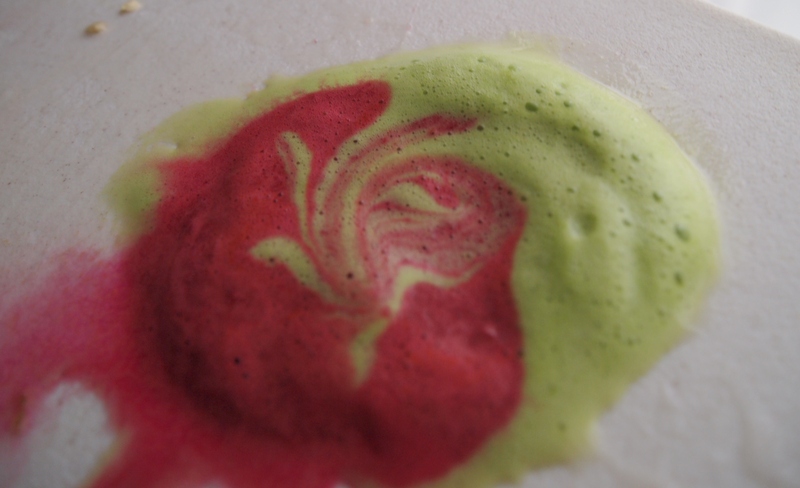 This juice is alkalinizing and filled with phytochemicals, vitamins, antioxidants, enzymes, light energy and minerals. I can’t imagine a more nutritious way to start the day.